Note the downturns in productivity during recessions (complete list here): 1953/54, 1957/58, 1960/61, 1969/70, 1973/75, 1980, 1981/82, 1990/91, 2001. 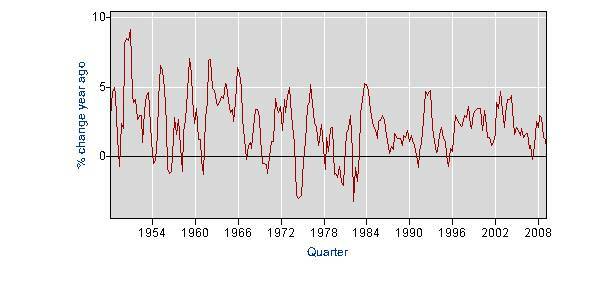 A decline in productivity is logical and to be expected in recessions. Against all odds, the current cycle has not seen a similar productivity drop. To be sure, manufacturing productivity is now distinctly negative, but the overall economy continues to see productivity gains. The productivity gains are more than a mere curiosity. Productivity is one of the great drivers of economic growth. If there are fundamental factors supporting these gains, one could argue the case for a much more vigorous economic rebound than most forecasters (including me) expect. The steady gains from the 1990s have largely been attributed to new information technology and a managerial culture that supports and incentivizes its adoption. (see, for example, this thoughtful piece by Martin Feldstein). One would think that productivity gains from the adoption of information technology and incentive systems would have diminishing returns without significant new technological breakthroughs. Haven’t we all adopted the interenet? Or could there be a whole new productivity revolution? The productivity statistics suggest that something significant is happening. I believe there is the potential for a whole new round of efficiency gains to be won from creative new applications of internet and other existing communication technology. There’s a case to be made that the applications of this technology have only been enhancements of existing business models (e.g, electronic bill-pay is not so different from writing out checks, online retailers are not so different than catalog stores, etc. ), and do not reflect the opportunities available in creating whole new ways of structuring businesses. We will only know years hence whether such a technological revolution is in the works. However, I think a concrete example can illustrate this point. Consider the publishing/book-selling industry. Amazon.com, a truly impressive pioneer, and others have clearly added efficiencies to this business. However, at the end of the day, Amazon is just an online store structured much like any real world store — better prices and inventory perhaps, but similar nonetheless. Even the book recommendations and purchaser feedback is not all that dissimilar from bestseller lists and “staff picks” available at my local bookseller. But there are other ways, as yet unexplored, of restructuring this industry using technological advances. The biggest costs of book publishing revolve around the fact that publishers initially have no idea which books will sell. Publishers must go to the enormous expense of printing and distributing books. If they don’t sell, the publshing firms are then forced by the bookstores to accept the returns. This system produces uncertain financials for publishers, constrains marketing budgets, wastes bookstore shelf space with unwanted books, and results in long delays in royalties for even successful authors. OR Books is seeking to build an alternative structure for the industry, first launching new books as “e-books,” to test demand. At least part of the savings from the forgone initial printing will be used for marketing and promotion. Once demand for the e-book version establishes interest in the text, then and only then will OR Books do a tradition print and distribution run. Not only should this eliminate print and distribution costs for unsaleable books, this also give OR Books better leverage in distribution terms with bookstores. Bookstores benefit by stocking books for which there’s known demand. Authors benefit from having more promotional dollars available to (electronically) launch their books. It seems probable that readers should benefit too from the opportunity to hear more about new authors. If successful, this could be not only a different, but a better way of publishing. Although I wish them every success, I have absolutely no idea whether OR Books will succeed. This venture, however, forces us to consider that the productivity gains from telecommunication technology may have a long way to go. Certainly our unsinkable productivity numbers suggest something significant is going on in the economy. Capitalism has been famously described as “creative destruction.” The past 18 months have been focused only on the destruction element. Perhaps there’s hope to be found in capitalism’s essential creativity. Disclosures: I have no investment opinion of OR Books, no personal or client direct interest in that or any other company in publishing/bookselling, and lest there be any confusion generated by John Oakes’ comments, I generally disagree with John’s politics as well! This entry was posted on June 18, 2009 at 10:27 pm and is filed under Market insight. You can follow any responses to this entry through the RSS 2.0 feed. You can leave a response, or trackback from your own site. I would be interested to know whether the measurements of productivity are valid as that would be the first thing that I would check before believing that something positive and interesting is afoot in the economy.